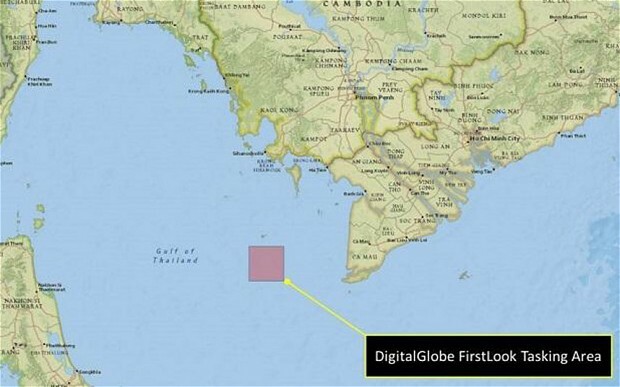 According to an article in The Telegraph, an unprecendented crowd-sourcing effort was launched to scour the internet looking for the missing Malaysia Airlines Flight 370. Earth imaging Colorado-based DigitalGlobe trained two of its satellites on the locations where the plane was believed to have gone down, and put out a call to computer users to scour the ocean. Pinpoint images taken from 400 miles above are so vivid that you can see objects measuring a foot square. Images from thousands of square miles of water are made into smaller areas that crowdsourcing volunteers can zoom in on and tag if they see anything that may resemble debris. The areas where the most tags are dropped will be sent to authorities as promising areas to search. At press time a month ago, more than 100,000 people an hour had been analyzing the images and had covered nearly 4,000 square miles of ocean. Every pixel had been viewed by at least 30 pairs of eyes. According to the report, images from another 5,500 square miles of open water are expected to be posted for examination on the system, known as Tomnod. Nearly 650,000 tags had been dropped in an area between the Gulf of Thailand and the South China Sea where the Boeing 777 was first believed to have gone down on Saturday. This entry was posted on Friday, April 11th, 2014 at 9:25 am. You can follow any responses to this entry through the RSS 2.0 feed. You can leave a response, or trackback from your own site. Awesome! Many hands, many eyes, quicker. The disappearance of Flight MH370 may become the Titanic of the 21st century; we’re hopeful that recovery will take less time. With satellite technology we’re also reminded of the size of the ocean and the possibilities.